/EINPresswire.com/ -- SAN DIEGO, CA--(Marketwired - May 04, 2016) - Earlier this year Baja Brewing Company, the first craft brewery in the Mexican state of Baja California Sur, reached out to their neighbors across the border at Karl Strauss Brewing Company, the first craft brewery in the city of San Diego since prohibition, to discuss releasing an international collaboration beer. Karl Strauss Brewmaster Paul Segura and Baja Brewing Company Owner/Brewmaster Jordan Gardenhire took respective leads and brewed up this small-batch beer on the 10-Barrel satellite brewing system at the original Karl Strauss brewpub in downtown San Diego. 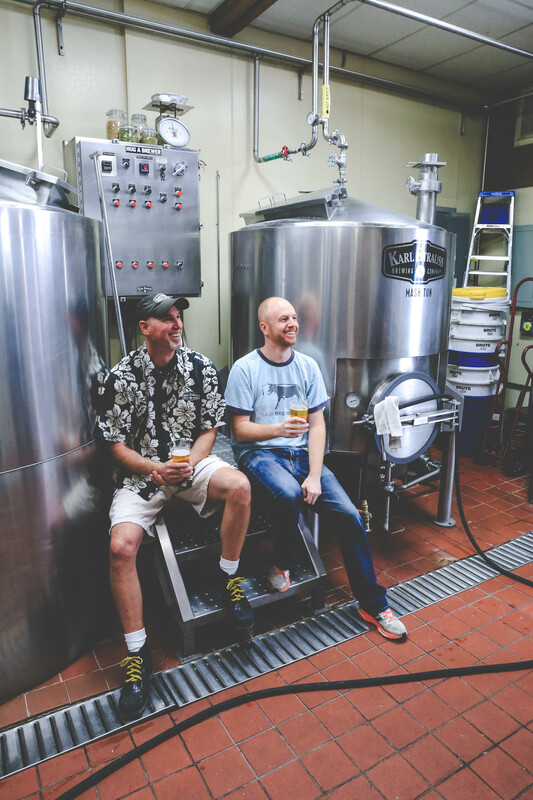 "Paul and I wanted to create a Mexican-inspired beer so we went with a lager. From there it seemed natural to add some agave nectar into the mash and some Habaneros during fermentation to give it some heat," said Jordan Gardenhire of Baja Brewing Company. The resulting brew, appropriately-named "Dos Californianos" ("Two Californians"), is an easy drinking Mexican Lager with subtle flavors of habanero and agave, balanced by a clean, crisp malt-backbone. Contrary to many beers that use the habanero peppers, Dos Californianos has just enough habaneros to add flavor, but stops short of having intense heat. "We wanted to capture the flavor of the habaneros in a refreshing, drinkable lager without that unquenchable heat you sometimes find, and we're really happy with how this beer turned out!" -Paul Segura, Brewmaster, Karl Strauss Brewing Company. The timing for this release coincides with Cinco de Mayo, a Mexican-inspired holiday primarily honored in the U.S. as a celebration of Mexican culture and heritage. Starting on Thursday, May 5th, a limited amount of Dos Californianos will be pouring at all Karl Strauss brewpub locations and in select craft beer bars in San Diego County. To learn more about Karl Strauss Brewing Company and Baja Brewing Company's collaboration brew, Dos Californianos, visit www.karlstrauss.com. Karl Strauss Brewing Company has pioneered the San Diego beer scene since 1989 with innovative beer releases like Aurora Hoppyalis IPA, Mosaic Session IPA, and Wreck Alley Imperial Stout. The brewery has won over 90 medals since 2009 and its Red Trolley Ale is one of the most award-winning beers in the world. The company is currently ranked #46 on the list of the country's top craft breweries with sole distribution in California. For more information visit www.karlstrauss.com or call the brewery at (858) 273-2739. Share it. Cheers. Since its inception in 2007 as the first brewery in Baja California Sur, Baja Brewing Company has been pushing the boundaries of Mexican beer. With three brewpubs in Cabo, Baja Brewing Company features eight styles plus seasonals. Focusing on all-natural and local ingredients, the brewery distributes throughout Mexico. In 2012, Baja Brewing Company entered the U.S. market with the introduction of Cabotella, its flagship blonde ale and is now available in seven states including Arizona, California, Colorado, New Mexico, Oklahoma, Texas and Utah. In 2016, a Mexican IPA was introduced in California. For more information about Baja Brewing Company, visit www.bajabrewingcompany.com. Paul Segura of Karl Strauss and Jordan Gardenhire of Baja Brewing at the original Karl Strauss brewpub in downtown San Diego.